Desert Shores is a stunning master planned community in northwest Las Vegas, backdropped by high desert foothills. 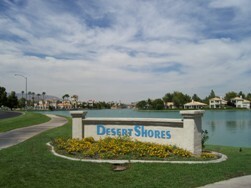 Founded in 1988, Desert Shores was the first development in the area, standing out like an oasis with four glistening man made lakes stocked with fish, a sandy beach swimming area, and miles of treed walking and jogging trails. The community now includes 22 distinct residential districts spread across 682 acres, with a wide range of home styles and high-end amenities on offer. All of the lakefront homes in Desert Shores have direct access to the water, and the option of private docks. Residents here also enjoy full use of a 2,000 square foot community center, and a several sports courts. Home choices in Desert Shores range from one to two bedroom condos and villas to six bedroom estate style homes. Prices for condos start in the low $200,000s, with high end full-size homes attracting values well into the millions. $1,000,000. Top priced properties commonly offer amenities like private pools, expansive balconies with mountain views, marble floors, and vaulted ceilings. With more than 3,000 homes on offer in Desert Shores, there's a property here to suit any buyer. Desert Shores real estate is located within easy reach of shopping, schools, and dining, enabling residents to easily settle into a high quality of life. Travel throughout the Las Vegas area is afforded via the I95, just two miles east. The Strip, meanwhile, is a quick ten to 12 mile trip south. Contact us anytime for more information on Desert Shores, or to organize a home showing.